I owe an apology to women everywhere, specifically, stay-at-home moms. A lot of men who think that they are the “breadwinners” of a family have this notion that mothers who stay-at-home with the kids all day are, in a way, either not pulling their weight or just sitting around, doing nothing the entire day. I’m a bit guilty of this. In the past, I would often get agitated with my wife when things around the house didn’t get done by the time I got home from work. I was guilty of thinking more than once It must be nice to sit around all day and watch TV. How wrong was I? Dead wrong. Fast forward a few years. My wife is now the one of us who goes to an office all day, and I’m now the stay-at-home dad. At first, I thought it would be a breeze and I’d get things done around the house on a better, more efficient system. In fact, one of the first things I did as a stay-at-home dad, was completely re-arrange the cabinets and the fridge. 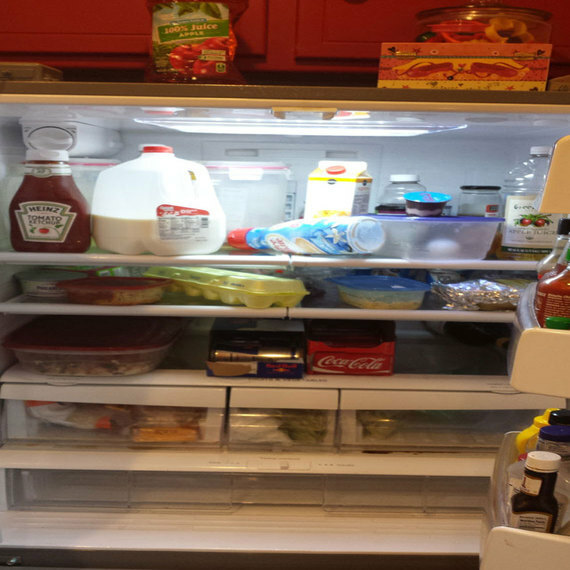 I had everything in the fridge lined up, labels facing out, broken down by type of food, condiments, etc. I was extremely proud of myself. Wanna know what my fridge looks like today? 6:00 a.m.: I get up, get my wife coffee, get my son in the shower, get his bag packed, make sure his homework is done, make sure his teeth are brushed. 7:01 a.m.: I walk through the door just in time to hear my 3-year-old whining and crying, begging for pancakes and juice. She likes to eat breakfast in bed, while watching her shows on TV. 7:02 a.m.: She gets her pancakes and juice and I usually get a thumbs up in approval from my daughter, but not always. 7:15 a.m.: I THINK about taking a shower. I can’t. 7:30 a.m.: The wife leaves for work. 7:30 a.m. – 9:00 a.m.: This block of time is really up in the air. Sometimes I get back in bed with the girls for a while. If I don’t get in bed with them, they get up at 7:30 a.m., and to be honest, I just can’t deal with two girls and all the drama that comes with them when they are exhausted beyond belief and cranky by noon because they got up so early. Plus I work every night until midnight and sometimes I need the extra sleep. However it’s not always restful when every 15 minutes I’m being kicked, rolled on, jumped on, headbutted or asked for a pacifier. 9:00 a.m.: I get a request (they think I’m a servant from their favorite restaurant called ‘Daddy’s Cafe’) from my 3-year-old that she wants “Chicken Nuggets and Juice”. After telling her it’s too early for Chicken and Juice, she immediately throws down a 5 minute tantrum until…*drum roll please: SHE GETS CHICKEN AND JUICE. She leaves me no tip. 9:05 a.m.: I try and sit on the couch with my laptop in a feeble attempt at trying to get some work done. 9:06 a.m.: My 18 month old is now eating chicken nuggets and drinking juice while sitting on my head. 9:15 a.m.: I brush off chicken crumbs from my hair and off of the couch. Sometimes she eats granola bars, and cleaning that up is an entirely different animal. 9:20 a.m.: I sit back down on the couch. 10: 30 a.m.: The 18-month-old naps while the 3-year-old watches TV, plays with her toys, and asks me a question every 20 seconds. 10:35 a.m.: I finally take a shower. 11:00 a.m. – 12:00 p.m.: I finally manage to sit down and get a few things done for work. * NOTE: It is now NOON and not one ounce of housework has been done. 12:00 – 12:30 p.m.: The kids eat lunch — surprise more chicken! — while I do a modest attempt at trying to keep the kitchen clean while cooking them what they think is a 7 course meal. I might as well hang a sign on the fridge that says ‘Daddy Cafe open 24/7’. 12:30 – 2: 00 p.m.: I finally get to clean the kitchen and do some laundry. If I’m lucky I get to pick up some of the 19,000+ toys and blocks laying on the living room floor. I’m super lucky if I can get through the living room without stepping on one of those extremely sharp toys that Toy companies think are safe to sell to children. It’s like walking through a landmine, in a house full of hostile terrorists. 2:00 – 2:30 p.m.: I get the girls dressed so we can walk down to the bus stop. Yes, THEY ARE STILL IN THEIR PAJAMAS. 2:30 – 3:00 p.m.: The girls play at the bus stop waiting for their brother to get off the bus. 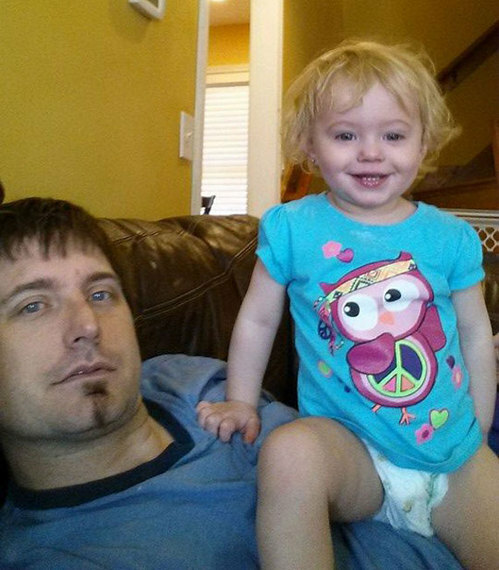 3:00 – 4:00 p.m.: The girls lay down for naps, my son goes to his room. The kitchen is a disaster again from him getting out snacks and exploring the cabinets. Sometimes I manage to take this hour for myself to catch up on some work, but not always. 4:00 – 5:00 p.m.: I referee my son and daughter who are arguing about various issues including territory in the house. 5:00 – 6:00 p.m.: I help my son with his homework, clean the house, sweep the floors, cook dinner. 6:00 p.m.: Wife gets home and we eat dinner. Most days I’m too exhausted to go into much detail of how the day went, and sometimes I’m so frustrated I eat dinner on the front porch, alone. NOTE: This is on a GOOD day. Every day is different. I didn’t add in the sick days, the 1 hour melt downs, the various random messes, the errands, the castles I build out of blocks, the shampoo I have to clean off the floor, the dish-washing detergent that I have to clean out of the dog’s water dish, refolding the clean laundry that the kids have strung all over the house, the pee puddles that I have to clean up from when the baby rips off her diaper and pees on the kitchen floor, the baths I give mid-day because one of them thought it would be funny to splash around in a mud puddle, the re-hanging of curtains that the kids have ripped from the walls, putting drawers back into the dressers that they’ve pulled out and slid around the house like cars, and so forth and so on. So whomever gets home from work, if it’s the husband or the wife, they have no idea what their spouse has been through during the day. I sincerely apologize to any woman I might have said anything negative about, or joked about in regards to being a stay-at-home mom in the past. It’s not an easy job. In fact, it’s the hardest job I’ve ever had. Sure, it has it’s moments, but it is a very challenging, very stressful job that is all held together, for most people at least, by a good bottle of wine, and a very warm and very quiet bath.